There will be a 15 minute break after Levels 4, 8, 11, 15, 18, and 21. THIS IS A BEST STACK FORWARD EVENT. Any player to bag chips in more than one flight will receive a payout of $1,200 for each additional stack, and will carry forward only their largest stack to Day 2. Here is a look at the 25 players advancing to Day 2 in the money from Flight C of the $600 No-Limit Hold'em Re-Entry event. These 25 will join with the 19 from Flight A, the 14 from Flight B, and any that bag in tomorrow's Flight D. Day 2 play will begin at 12:00 noon Tuesday May 9th. So far, no players have bagged in more than one flight. Any player to do so will carry only their largest stack forward, and will be compensated $1,200 for each additional stack that they bag. The final 25 players are now bagging up their chips for the night, and will return to play Day 2 on Tuesday May 9th at 12:00 noon. Zhi Wu bagged the flight B chip lead, having ended with 450,000. 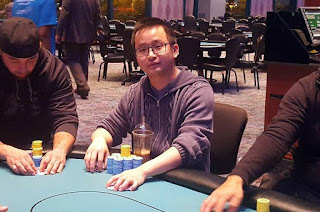 Soukha Kachittavong ended the night in second with 352,000, and rounding out the top three is Tyler Loranger with 309,500. A full list of all advancing players will be posted in the next few minutes. Event #1, Flight C - "Happy Birthday Soukha"
The General was just eliminated by James Magner after he shoved all in holding K♠K♦ against Magner's A♣J♣ on a A♥9♣6♥4♣ board. The General was unable to improve on the J♠ river, and was eliminated from play. After the General's elimination, there are now 26 players remaining, with 25 making the money, which means we have reached the hand for hand portion of play. 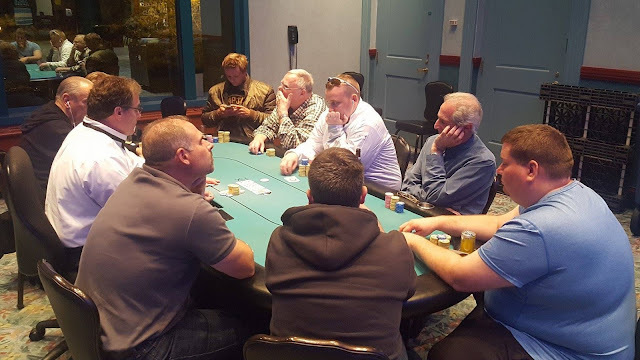 Play will continue until we lose one player, and then the remaining 25 players will bag up their chips to return for Day 2 on Tuesday May 9th at 12:00 noon. The remaining 46 players are in the middle of their 60 minute dinner break. They will return to play Level 14 (1,000/2,000 blinds and a 300 ante.) The average chip stack coming back from break will be 88,695. Play will resume around 8:10pm Eastern Time, and they will play down to 25 players (12% of the field) before bagging up for the night. 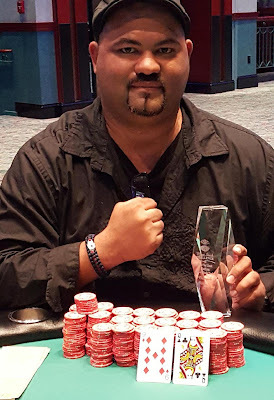 There were a total of 204 entries in the third flight of the $600 No-Limit Hold'em Re-Entry Event #1. The field will play down to the final 25 players before bagging and tagging later tonight. Those 25 players will join the 14 players that advanced in Flight A, the 19 that advanced in Flight B, and any that advance in tomorrow's Flight D, to play Day 2 on Tuesday May 9th at 12:00pm. All players that make Day 2 will return in the money, and any player that bags in multiple flights will take home $1,200 for each additional stack they bag, with only their largest stack advancing to Day 2. While Event #1 is on a short 15 minute break, we thought we would bring you a quick look at some of the action from the Omaha Hi/Lo 8+ Field today. 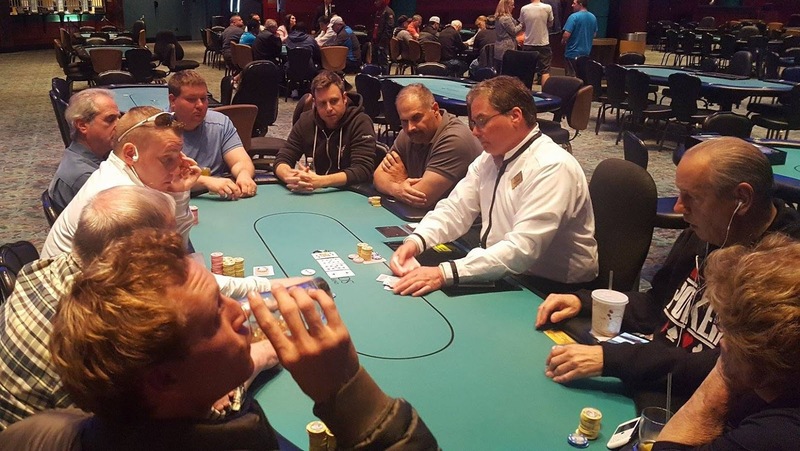 There were a total of 60 entries in today's $300 Omaha Hi/Lo 8+ event, generating a prizepool of $15,132. The top 7 places will make the money, with first place taking home $4,918.